These instructions are for Ubuntu 11.10 running under VirtualBox 4.1.8r75467 on Windows 7 with SP1. They should be the same for other version combinations, but no guarantee is made. It shouldn’t matter on which host VirtualBox is running, but I don’t run it on anything other than Windows. I have not tried shared folder with other Linux distros, so these instructions may or may not work with them. Assumes you have installed VirtualBox Guest Additions on Ubuntu 11.10. Instructions to do so can be found here. 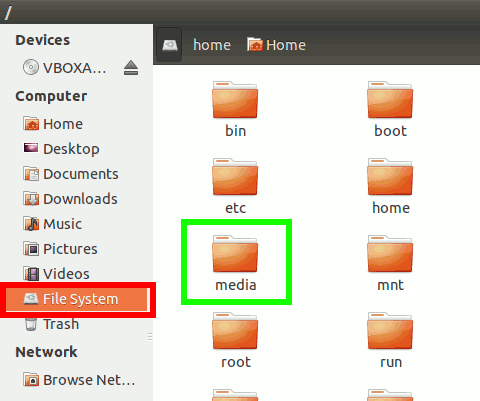 If you have already enabled folder sharing and want instructions on how to add a shared folder to Ubuntu, instructions can be found here. Shared folders allow you to easily share large files or large amounts of data between the host OS and the guest OS. In my case, I share code so I can test my code on both Windows and Linux. 3) Restart the machine. The changes will not take effect until the machine is restarted. Assumes you are using the Unity interface. Shared folders are found in the /media folder. The shared folders will be found inside. Shared folders are prefixed with sf_. For example, if you shared a folder called my_code, then it will appear as sf_my_code in the media folder. Whenever you share a new folder, you need to restart the machine for Ubuntu to pick it up.